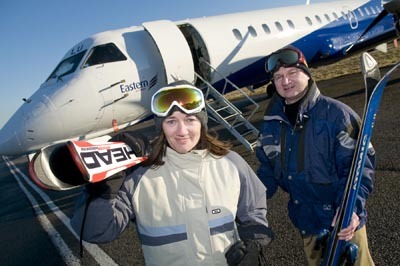 Eastern Airways launches its first ever service to Oslo on Monday 12 January 2009, with a direct air link from Aberdeen to the Norwegian capital. The new direct service follows the UK regional airline’s successful route from Aberdeen to Stavanger and demonstrates the airline’s commitment to expand services into Norway. Today’s inaugural flight leaves Aberdeen at 10.20am and arrives in Oslo at 1.05pm local time. From Oslo weekday flights depart at 1.45pm, landing in Aberdeen at 2.30pm local time. Sunday services leave Aberdeen at 12.20pm, landing in Oslo at 3.05pm local time. Flights depart Oslo at 3.35pm, arriving in Aberdeen at 4.20pm local time. Services are operated by a 50 seat Saab 2000 aircraft. The latest route complements Eastern Airways’ network of 11 destinations already served from Aberdeen and will offer greater flexibility for the many businesses which have bases in both Aberdeen City and Shire and Norway. Norway is the third largest exporter of oil in the world and a number of energy related companies have offices in Oslo, which has the busiest cargo port in the country, along with many shipping companies and insurance brokers. Oslo Airport Gardermoen, which is Norway’s largest international airport, is located 50km north of the city and is just a 19 minute rail journey from Oslo. Graeme Ross, Eastern Airways’ Scotland director, said today’s launch was a significant stage in the airline’s growth. “Today marks our first direct service to the Norwegian capital and this important link will meet the needs of both business and leisure travellers. Mr Ross said the new service would offer opportunities for passengers to experience Norway’s rich heritage and culture. Kevin Brown, Aberdeen Airport’s Managing Director, welcomed the start of the new route. He said: “Eastern Airways has been a real success story at Aberdeen, growing to become the biggest airline operating out of the North-east in terms of its route network. We welcome this latest round of expansion. It signals Eastern Airways’ commitment to Aberdeen, and its ambitions for the future. ”Aberdeen now serves more destinations in Scandinavia than any other Scottish airport. These links are important for business and tourism in the north-east, and Norway is particularly important, given its status as a major player in the energy sector. With daily flights to Oslo now available, this new service brings one of Europe’s most important capital cities closer to the North-east. Rita Stephen, development manager for Aberdeen City and Shire Economic Future (ACSEF), added: “We warmly welcome this new direct route between Aberdeen and Oslo, which will offer even greater choice to the local business community and particularly those working in the energy industry. Oslo is an ideal short break destination located on the shore of Oslo fjord and close to the Oslomarka green hills. The city has international cuisine, cosmopolitan shopping and a variety of art museums, and with its Viking heritage a visit to the Viking Ship Museum is a must. In the winter Oslo has hundreds of kilometres of cross country ski trails and eight ski centres. Aberdeen City and Shire will also appeal to Norwegian tourists taking golfing holidays, visiting the world famous malt whisky trail, the variety of historic castles and shopping trips to the city centre. As well as Norway, Eastern Airways also flies from Aberdeen to Bristol, Durham Tees Valley, Newcastle, Southampton, Leeds Bradford, East Midlands, Humberside, Norwich, Stornoway and Wick. All passengers flying with Eastern Airways from Aberdeen have access to its dedicated airport business lounge and the ThreeGreen hosted security service including channel, as well as short check-in times and no charge for hold baggage.